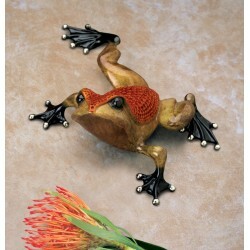 Tim Cotterill, FROGMAN, is world famous for his bronze frog collectables. He has an uncontrollable passion for frogs and loves everything about them — their faces, their webbed feet, their springy legs and their antic nature. 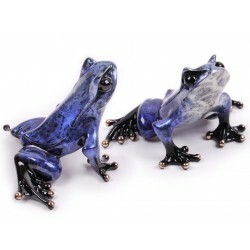 He incorporates every possible expression, contour, and subtlety of these amphibians into his colorful enameled bronzes. Growing up in Great Britain, he developed a lifelong love of things that go "jump" in the night. 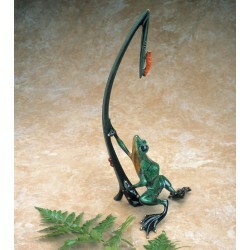 Says Tim, "As a little boy, I always loved looking for frogs in the fields of England." 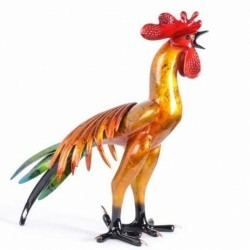 Tim Cotterill apprenticed as an engineer intrigued with metalworking and soon became a master of metal sculptures. For the next ten years, he created over a thousand bird and animal sculptures in metal, many of which were sold at Sotheby's. 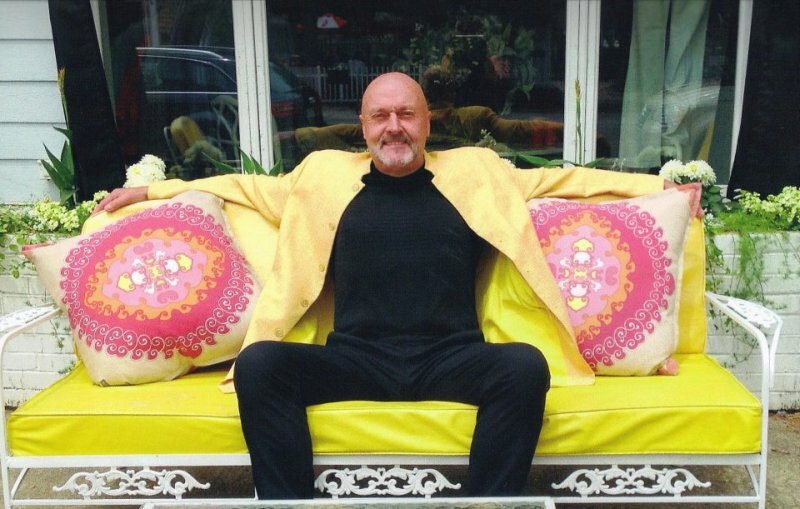 Once he moved to Venice Beach, California, Cotterill discovered frogs as a sculptural form through which he could express his delightful sense of humor. What makes Frogman’s frogs unique is that many bear human traits of different characters - a dancer, swimmer, the prince charming, etc. 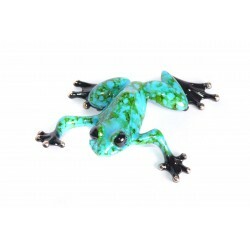 These frogs are being snapped up by people all over the world, including many celebrities. 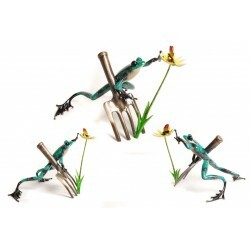 Sales of Frogman's bronze frogs, geckos and koi fish sculptures make him the largest selling sculptor (of small bronzes) in the world. 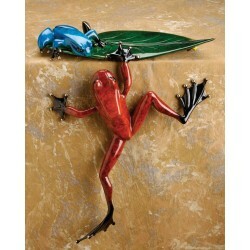 Since no two frogs are alike, the process is painstaking. Cotterill begins by forming a pose on a wire frame. "Then I'll get car body filler and start laying it on and sanding it back until it builds and builds." Finally when it's smooth enough, he sends it off to his foundry to be cast in bronze. His passion is now making this modest Frogman a living. 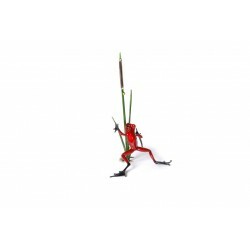 “Guess all that daydreaming during school paid off!” Tim Cotterill's bronze frog sculptures capture the whimsical character, the jewel-like quality, and the pure JOY of these beautiful little creatures. "Through the centuries and throughout the world, FROGS have symbolized many things - Good Luck, Royalty, Fertility, Magic Potions, Energy, Charm, Indiscretion, etc., etc. In today's fast world, life sometimes becomes complicated and stressful. As you can see, my art is not. It's Elegant, Stylish, and Whimsical & Unique and is pure FUN! It makes people SMILE! The more we smile, laugh, and feel happy, the healthier we become. I hope my art brings more happiness and joy into your life." — Tim Cotterill, The Frogman. 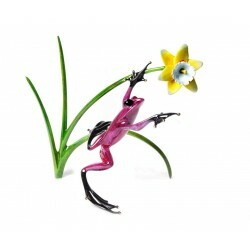 Watch the The Frogman create! Tim Cotterill There are 181 products. 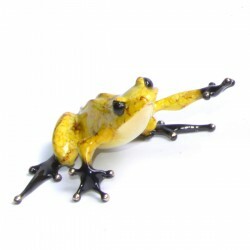 Chai by Tim Cotterill Frogman 3.5" x 2.75" x 1.5" Edition size 1000 Also available in a matched number set as High Tea. Chase clearly exhibits quite the spirited attitude. 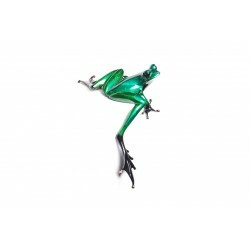 The variegated blue/green patina enhances the form and motion of this plucky, gem of a sculpture. BF230 Chase Edition size 1000 3" x 3" x 1"
The colors of the swirling cosmos appear in this beautiful periwinkle silver nitrate patina. 3rd in the Gems Collection Edition Size: 5000 Regular Material: Bronze Color/Finish: Periwinkle Dimensions: 1.5" x 2.75" x 2"